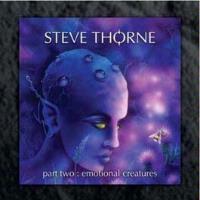 Steve Thorne's first Emotional Creatures CD was a masterpiece of melodic progressive rock. Well, this one is, too. In fact, it's probably going to make my list of best albums of the year, but we'll see. Once again he's joined by a number of famous guests. Once again his talent for creating catchy, yet challenging music is the key to the success of the whole project. If you like prog along the lines of the more melodic old Genesis and Marillion, you'll love this disc. Fans of Tony Levin, Spock's Beard, Marillion, Yes and Asia will probably want to pick it up based on the guest appearances. The thing is, once you give it a listen, you'll be hooked. Pretty ambient tones begin this and as the song proper begins to rise it reminds me a lot of vintage Genesis. This is bouncy and tasteful and a great instrumental introduction to the proceedings. Spock's Beard fans will note the appearance of Nick D'Virgilio here. Aisa and Yes fans will be interested to note that Geoff Downes also plays on this one. This starts off as a tasty prog ballad. As the bass brings in an almost funky texture the cut takes on another dimension. It turns a little “rock and roll” at times and the chorus is extremely catchy. Overall this is a cool little piece. The most notable guest on this one is Tony Levin. Here I am again reminded of Genesis on the mellow ballad mode that leads this off – and the way it rises gradually upward. Sure there are other sounds there, but Genesis is the one that stands out the most to me. All three special guests from the last couple songs appear on this one. It moves out into extremely lush and beautiful territory as the arrangement fills out. There's a tasty acoustic guitar solo that flits around for a while. This turns more energized later and becomes a rather Yesish tour-de -force. This one is definitely a highlight of the disc. It does a great job of balancing mellower segments with more rocking ones to create a wonderful sense of dynamic range. OK, right out of the gate, let's say, “no, Thorne is not covering the overplayed Yes song.” Instead, we get a very understated mood piece that reminds me a bit of some of the similar cuts from early Marillion. This is a nice change of pace and another great track. The lyrics even call to mind Marillion a bit. D'Virgilio is also present here. On this track we're treated to the entire rhythm section of Spock's Beard as Dave Meros is the bassist, while D'Virgilio still provides the drums. This comes in as essentially another ballad. The Genesis type sounds are present once more. As always on this disc, when I say that I'm referring to early Gabriel era Genesis, not the pop period of the band. It rises up gradually and in dramatic ways. There are certainly more elements of Fish era Marillion here, too – at least to my ear. This remains fairly sedate for about three fourths of the song, but once it powers out its into a stellar prog rock jam with some great textures and changes. This is another highlight of the disc and features some of the coolest musical passages on show here. A bouncy texture, but still almost balladic, creates the early textures here. The vocals (as they do on a lot of the disc) remind me of a cross between Peter Gabriel and Fish. They work this out into an inspired and powerful prog jam for the choruses, but drop it back (not quite as far) for the verses. This gets quite intense as it carries onward. Tony Levin is back to help D'Virgilio hold down the bottom end. Acoustic guitar (or possibly mandolin) starts this off in a folky style. The vocals come in over this backdrop. It turns more towards prog ballad as it carries forward, but I hear traces of The Beatles on this, too. It's another great track and serves as a nice change of pace as it never really soars to the energy level of some of the other material. Instead it creates an oasis and a place to relax for a time. The Beard rhythm section is back on this cut, another instrumental. Starting off with melodic, sedate (yet powerfully dramatic) tones, this launches out into a killer excursion from there. Although I'm not often a huge fan of instrumental music this may well be my favorite cut on the whole album. The changes and progressions – and the overall tones and textures – make this simply incredible. The killer guitar soloing doesn't hurt at all either. This one alone is worth the price of admission. This seems to segue straight into the next track. This one can be looked at almost as a continuation of the last track. It's an atmospheric mood piece that sort of serves to pull things back down. 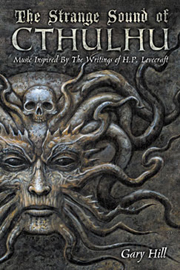 The main difference, though, Thorne provides all instrumentation on this one (and sound effects) himself. Here we get more melodic prog that again reminds me quite a bit of Marillion (Fish era). Some of the resolutions on this have a very different texture. That Marillion comparison might seem obvious because Pete Trewavas (bassist for that band) joins Thorne and D'Virgilio, Geoff Downes and others for this track. There are segments that remind me a lot of the proggier period of The Beatles' output here, too. In fact, if you can listen to the soaring instrumental segment late in the track and not think of The Beatles, there must be something wrong with you. The same holds true for the bounding “take a trip a day...” section. This is a killer track and another highlight of the disc. Trewavas, Downes and D'Virgilio are back on this track. A pretty piano ballad style leads it off. The cut powers up in a very organic manner and again calls to mind Genesis a bit. Several variations and themes take it with more (albeit less obvious) Beatles elements showing up. This feels quite playful and triumphant and is a great track. It serves as a satisfying conclusion to a very strong disc.